Opytne, Eastern Ukraine: Mariya Gorpynych, age 76, lives alone. 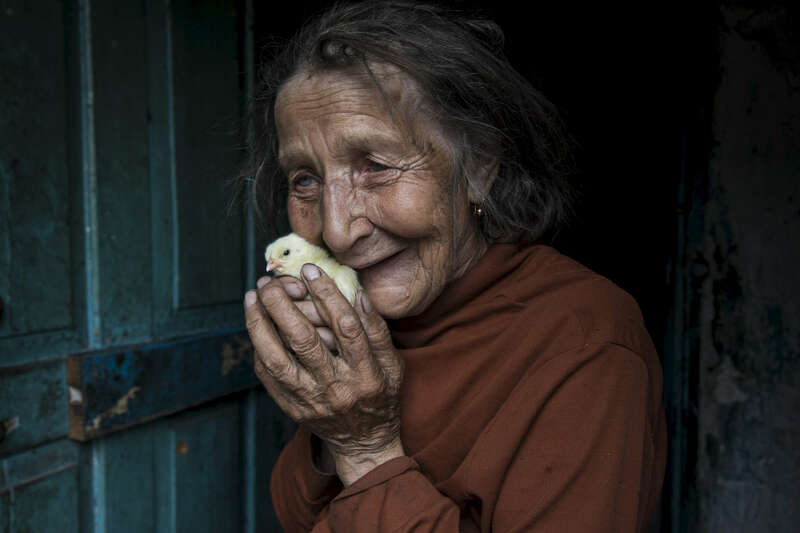 She holds new chicks delivered by ICRC as part of a humanitarian aid service for elderly that live alone. It also allows them to raise chickens for some income. She speaks with tears in her eyes when talking about the death of her son. Victor,48 was killed due to the war in 2016, he was fatally injured by shelling that hit the home. He died in her hands. Her husband, died in the same year from a heart attack from extreme stress of living too close to the front line. Mariya refuses to leave her village because her family are buried there. "I have nowhere to flee, my whole family is buried here." "I got used to the continued shelling." Opytne is a war torn village on the contact line where only 43 people are left due to the dangers.